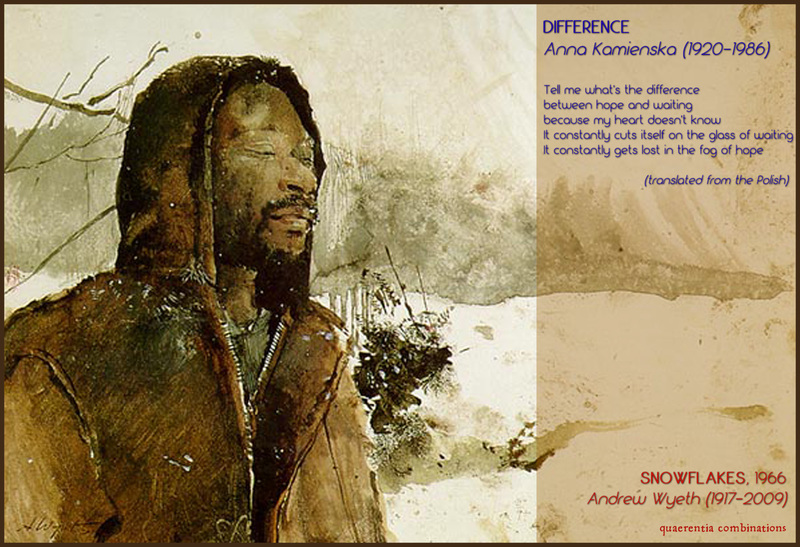 I didn’t know anything about Anna Kamieńska before – but it’s naturally sent me on a bit of a trail. She was clearly a remarkable person, living in desperate times in Poland – first under Nazi occupation and then Communism. She never lived to see the Berlin Wall fall. I just love the brittleness of the ideas and words (which the translation somehow corroborates – though I’ve obviously no idea how the original Polish conveys this). But for those who have tried to cling to hope in dark times, it is so easy to relate to her experience. This really is life (and hope) by faith not sensory perception. It’s hope that is clung to in the face of bitterness and confusion – in Kamieńska’s case, in a context where the only legitimate hope was for that shoddy pipedream of a socialist utopia. I kept feeling a winter’s chill as I reread it. But was deeply moved by her apparent willingness to both wait AND hope. So I had to find an image to convey that. I’ve always loved Andrew Wyeth, the middle generation of the Wyeth dynasty from Chadds Ford, PA. I actually had a completely different painting in mind, but when I started hunting for it, I came across this watercolour from 1966 which was even better. Just stunning. Unfortunately I couldn’t find a decent resolution, so it comes across a bit pixelly. But it perfectly captures the fragility (not to mention the frigidity) of the winter hope that Kamieńska so effortlessly evokes. Epic.